The gut is one of the horse’s most delicate internal systems and is easily agitated by food, parasites, stress, bacteria and stomach acid. The latter is responsible for the majority of all stomach ulcers but is not the sole cause. Unlike the human stomach which is stimulated to produce hydrochloric acid only when we eat food, the horse’s stomach produces it continually, causing problems if left unabsorbed. Because horses have evolved to graze near enough constantly, stomach acid has always played an important role in the digestive process. However, because the equine stomach is small in relation to the size of the animal, acid accumulates quickly if it is not neutralised. For stomach acid not to pose a problem it must continually be offset by food and forage. Chewing hay encourages salivation which is a great counter-balancer. Too much acid in our stomachs may cause us to vomit, but the structure of the equine gut and esophagus is such that a horse cannot vomit, meaning anything swallowed that upsets the stomach must continue through the system. This also has implications for horses with colic-related illness. Gastric ulcers develop as a result of excess acid corroding the stomach. They range from small, open sores to more serious lesions that refuse to heal. Because the horse's stomach continues to produce acid, complete healing is difficult to achieve and ulcers often return. If a horse goes a prolonged period of time without eating, an ulcer can develop quickly and without warning. Food is needed to absorb and neutralise the stomach acid that is continually being produced so if feeding is irregular, surplus acid can lead to inflammation, erosion and ulceration of the delicate stomach lining. This occurs when the level of hydrochloric acid outweighs the level of protective chemicals lining the stomach (chemicals that prevent the stomach from digesting itself) so that the acid is free to damage and blister the unprotected mucosal surface. In extreme cases, the ulcer can penetrate the stomach wall leading to bleeding if a blood vessel is involved, and severe and even fatal peritonitis. If a horse hasn’t eaten, has eaten the wrong things (i.e. a high concentrate/grain diet), is intensively exercised or physically stressed, the stomach is at risk from ulcers. The anatomy of the stomach lends itself better to digesting small meals regularly rather than one or two bigger meals a day. Large intervals between feeding promote the perfect environment for ulcer formation. Feeding regularly ensures that the stomach acid is always being absorbed and isn’t left to fester. Regular turnout is crucial for ulcer avoidance as it allows the horse to graze and forage, thereby keeping the digestive processes ticking over. Horses that are stabled for long periods of time and fed once or twice a day must always have hay on offer in the stable. If not, they are at high risk of developing gastric ulcers and colic as acid sits in the stomach for too long without being absorbed. 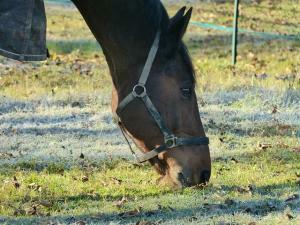 How do I know if my horse has a gastric ulcer? Identifying gastric ulcers isn't straight forward as many horses won't show clinical signs. Sometimes an ulcer will develop gradually and this usually happens in the lower (glandular) portion of the stomach, where the lining is more resistant. Ulcers in the upper (squamous) portion of the stomach develop at a faster rate as the stomach is more sensitive here, often within 48 hours of feed deprivation and 5-7 days with increased exercise. Exercise is thought to increase pressure in the abdomen, which in turn forces acid upwards into the squamous stomach. Blood flow to the stomach removes acid, and this is thought to decrease with exercise. Symptoms of colic might indicate the presence of a gastric ulcer i.e. restlessness, lying down and loss of appetite. Other signs to watch out for include weight loss and loss of condition, crib-biting, poor performance and lack of energy/stamina, diarrhoea and increased salivation. Most horse owners report weight loss as the first indicator of gastric ulcers. If your horse shows any of these symptoms, particularly unexplained weight loss, contact your vet immediately. What are the risk factors and how can I prevent gastric ulcers? Foals are particularly prone to gastric ulcers due to the high level of hydrochloric acid they secrete during nursing. The foal's stomach is a lot more sensitive than the adult horse's stomach so it is more susceptible to damage. More than half of foals will suffer a gastric ulcer although these are usually mild and heal of their own accord. An affected foal is likely to experience diarrhoea, teeth grinding, excessive drooling and will spend a lot of its time lying down. Up to 30% of adult horses will get a gastric ulcer, although they are less common in horses that have regular turnout. Symptoms are usually non-specific and will range from discomfort (colic), weight loss and poor appetite, to behavioural changes and diminished performance. Medications to lower stomach acidity can be effective, providing the condition is caught before complications arise. Another susceptible demographic is race horses and horses in high intensity work. In fact, approximately 90% of race horses will develop a gastric ulcer at some point in their lives, with half of them displaying no symptoms at all. Endurance horses and those that event and show are also more prone than everyday riding horses, with a 40-60% prevalence in this group. In many cases gastric ulcers can be very performance limiting, with a high reccurence rate. But why are race horses such a high risk? The unique backstage conditions of the race track make performance Thoroughbreds more susceptible to ulcers than regular adult horses. They are fed a strict diet and face intense competition training and racing. They are regularly transported and confined to stables, which limits their time spent on pasture and contributes to their levels of stress. Stress causes a higher secretion of hydrochloric acid in the stomach which encourages ulcer formation. How can I prevent gastric ulcers? Many people believe that the formation of gastric ulcers is an issue of management, while others think some horses are just more predisposed to them than others. When it comes to performance horses, the former is probably true. To stand yourself (and your horses) in the best stead of avoiding ulcers, there are a number of things you can do. These take into account aspects of feeding, exercise and stress - all factors that contribute to over secretion of harmful stomach acid. - If you are feeding your horses a concentrated diet high in carbohydrates and grain, replace this with something more balanced and containing fibre. Grain (starch) triggers the stomach to produce more digestive acid so space meal-times at no less than 6 hours apart to avoid acid build-up, if you must feed it to your horse at all. - Allow free access to grass or hay (not straw). Horses have evolved to graze constantly so should never be deprived of forage. 24-hour turnout is ideal. Horses that are stabled should always have access to forage so that their stomachs are not subjected to long periods without food. A diet combining hard feeds and alfalfa/alfalfa chaff is best. Having hay on offer is also essential when travelling as horses can become very stressed. - If your horse is stabled, apart from providing constant access to forage, try to reduce stress as much as possible. A stabled horse is less likley to be stressed if it is stabled along with other horses that it can see. Research has shown that stalls and trailers with mirrors installed can help to reduce a horse's stress levels considerably. Keep your stabled horse entertained with salt licks, treat dispensing balls, slow feeders and filled hay nets. - Try to balance exercise with rest. Over-worked horses are much more susceptible to ulcers. In fact, horses on 24-hour pasture with constant access to forage and light exercise are thought to be six times less likely than over-worked, regularly stalled horses to develop ulcers. In terms of routine, alter it as little as possible to keep your horse's stress levels to a minimum. - Digestive supplements can also benefit horses prone to ulcers and VioVet sells a great range here. The aim is to reduce stomach acid as much as possible without compromising the healthy digestive process. Medications that reduce gastric acid secretion are best for preventing and treating ulcers, so ask your vet about these if you suspect your horse is affected.